The Nigerian Afrobeat percussionist and singer Wura Samba and Berlin´s electronic multitalents Gebrüder Teichmann met in Lagos, Nigeria through the TEN CITIES Project. After their succesful debut on Soundway Records (V.A. 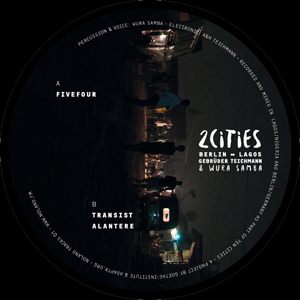 – Ten Cities) they are happy to present their first EP “2 Cities / Berlin – Lagos”, which is also the first release of the new NOLAND Tracks series. NOLAND Tracks is a subdivision of the brothers NOLAND label and will focus on the clubby and dancy side of the NOLAND label spectrum. Tracks for DJS and Vinyl lovers – raw and direct. TEN CITIES is a project by Goethe-Institute and Adaptr.Org.